Rabbit Hole Distillery is taking shape. Located in a wooded cul-de-sac neighborhood in Durham, N.C., this single-family residence, nicknamed Piedmont Retreat, is wrapped in vertical Corten steel panels facing the street, and vast expanses of floor-to-ceiling glass and cantilevered windows in the back that overlook the surrounding forest. Modernist architect Arielle Condoret Schechter, AIA, has a host of projects underway these days. Among the residential work taking shape in her home studio and office, high atop Stillhouse Bluff in Chapel Hill, is a Modern Cabin out in rural Orange County, North Carolina. A couple from San Francisco commissioned Schechter to design their Modern Cabin where one of their sons will live for a few years until they permanently relocate to North Carolina. The couple asked the architect for a “sort of rustic but more modern cabin” that would become their permanent home as well as a family get-together destination optimized for comfortable visits with their two children. Unlike stereotypical cabins, Schechter’s design expresses its modernity in materials, space, and architectural vocabulary. Abundant glazing will welcome sunlight and panoramic views of the wooded setting into the house. Under flat rooflines, the open floor plan will provide a natural, unfettered journey through the house and outside onto balconies and porches. Like any well-designed cabin, traditional or modern, the structure will be efficient and durable. Schechter expects construction to begin this spring. For more information on the architect and to see her built work as well as other “On The Boards” projects, visit www.acsarchitect.com. Arielle Condoret Schechter, AIA, is a licensed, registered architect based in Chapel Hill, NC, who specializes in Modernist, energy-efficient buildings with a focus on passive houses, NET ZERO houses, and her new tiny house plans, the Micropolis Houses™. She is a lifelong environmentalist and began practicing green design long before it became mainstream. She is also a lifelong animal advocate who lives in Chapel Hill with her husband, Arnie, and an assortment of foster animals in the modern, sustainable house she designed for them. For more information: www.acsarchitect.com. 1700 Glenwood Avenue before (bottom) and after (top). For transforming an odd, vacant eyesore into a gleaming glass, energy-efficient commercial building that deserves its place at the pinnacle of Raleigh’s Five Points intersection, Tonic Design principals Katherine Hogan, AIA, and Vincent Petrarca received a 2017 Sir Walter Raleigh Award for Community Appearance for their work on the building at 1700 Glenwood Avenue. Audio Buys closed in 2007 and the building sat vacant for four years. In 2011, the owners hired Tonic Design, an award-winning design-build firm, to upgrade it for leasing to a new generation of tenants. After installing new, insulated glazing, a custom shade system over the floor-o-ceiling glass walls, and zinc siding, the building could now shade its interior from glare and reduces summer heat gain by more than 70 percent. Yet it continued to languish uninhabited. In 2016, new owners called the Tonic partners back in, this time to increase the building’s function and make it more accessible. Among other improvements, the duo created a new glass-enclosed entry, staircase, and elevator tower; transformed the existing roof into a roof garden with spectacular views in every direction; and added a two-story steel sculpture (left) by McConnell Studios, entitled “Continuum,” to the West Whitaker elevation. Tonic’s award emanated from the Rehabilitation/History Preservation category, which honors the preservation or rehabilitation of existing buildings, especially Raleigh’s historic resources. “The designers have done a great job further repurposing a building instead of knocking it down,” the jury commented. For more information on the Sir Walter Raleigh Awards for Community Appearance, go to www.raleighnc.gov/sirwalterraleighawards. For more information on 1700 Glenwood Avenue and Tonic Design, visit www.tonic-design.com. Tonic Design is a multi-award-winning design-build firm in Raleigh, NC. Among many accolades throughout their careers, principals Katherine Hogan and Vincent Petrarca were named 2013’s “Rising Stars” by Residential Architect magazine. Their projects have been featured in a host of national publications, including Architectural Record, Residential Architect, Dwell, Custom Homes, Inform magazine, and Metal Architecture, and locally in the News & Observer, Waltermagazine, and Urban Home. For more information: www.tonic-design.com. Architects and designers create cool, modern cat houses for an auction to benefit SAFE Haven For Cats. 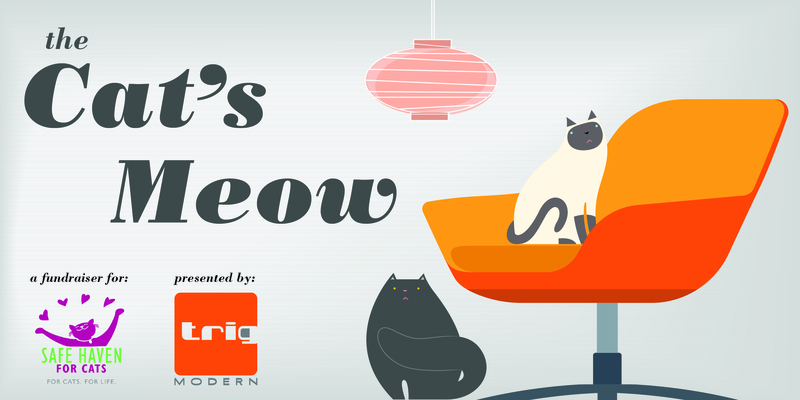 Trig Modern design center and showroom in Raleigh announces “The Cat’s Meow,” an auction of modern, professionally designed houses for cats to benefit SAFE Haven for Cats, a non-profit, no-kill shelter in Raleigh dedicated to finding homes for homeless cats and kittens. The auction will be held Wednesday, May 10th, from 6-8 p.m., during a Cocktail Party in Trig Modern’s showroom in Dock 1053, 1053 East Whitaker Mill Road. Raleigh. The Auction and Party are free and open to the public. Professional auctioneer Ben Ferrell is donating his services. Baum and Trig Modern’s owner, Bob Drake, were inspired to organize and present “The Cat’s Meow” after seeing the results of a similar event that architects in Los Angeles. “How cool can a cat house be? Just take a look at these,” she said, referencing Los Angeles Architects For Animals fundraiser for a local nonprofit. Completed cat houses will be delivered to Trig Modern May 4-6 and remain on display in the showroom until the night of the Cocktail Party and Auction. Those interested in bidding may stop in the showroom anytime during business hours (Monday through Saturday, 10 a.m. to 5 p.m.) to take a close look at the little houses prior to the auction. Anyone interested in participating in “The Cat’s Meow” – by designing a cathouse, providing in-kind donations, etc. – should contact Ann Marie Baum as soon as possible either by phone at Trig Modern, 919.516.8744 or by emailing her: annmariebaum7@gmail.com. For more information on Trig Modern, visit www.trigmodern.com. Founded in December 2012, Trig Modern is owned and operated by furniture and lighting designer Bob Drake. Through its combination of modern and mid-century-inspired furniture, lighting, wall and floor coverings, and accessories, as well as Modern kitchen and bath remodeling services, Trig Modern’s mission is to present a realistic portrait of sensible living and offer an antidote to excess, formality, and convention. For more information visit www.trigmodern.com, call 919.516.8744 and find Trig Modern on Facebook. The showroom is located at 1053 East Whitaker Mill Road, Suite 109, Raleigh, NC 27604. SAFE Haven’s mission is to ensure the well-being of every cat through adoption, affordable spay/neuter services, community outreach and adherence to no-kill principles. The shelter receives no government funds and relies solely on private donations for 84p percent of its budget. Visit safehavenforcats.org for more information. Three high-end, custom-designed, Charleston style homes. Shaw Design Associates of Chapel Hill and T.L. 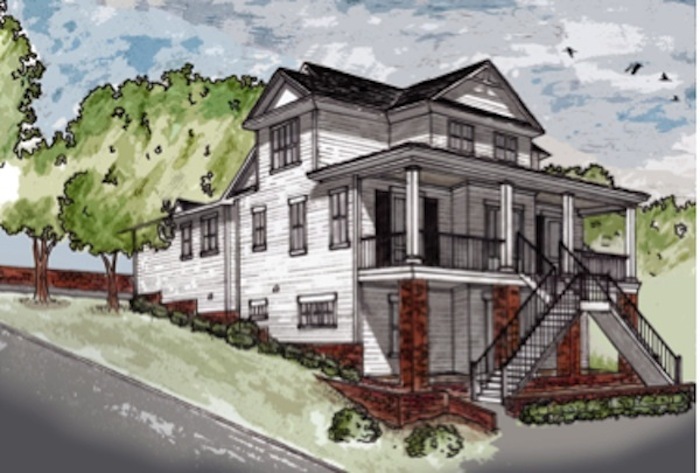 Stewart Builders of Sanford have announced that they have begun construction on their new Nottingham Road Project in West Raleigh — a trio of for-sale Charleston-style single-family homes. High-end custom home designer Keith Shaw, AIA, had worked with Terry Stewart on several estate homes in Chapel Hill’s gated community Governors Club. When Stewart secured the four lots on Nottingham Road for his first project in Raleigh, he turned to Shaw for architectural design. Stewart razed two nondescript duplexes on the property so that he and Shaw could reconfigure the property into three lots, rather than four, with an alleyway connecting the three. During the design development stage, Shaw used the natural grade of the land which slopes down towards Nottingham Road, to place the houses’ garages on grade – “on the high side,” he said — at their rear elevations. As a result, the facades will rise two to three stories above the street and provide future homeowners with panoramic views of the wooded neighborhood, park area and “greenway”. There are many variations of Charleston-style architecture, but one distinctive Low Country design element is the raised main level and entrance. Main levels were raised off the ground in Charleston to avoid floodwaters and to allow breezes to circulate under the house. Shaw’s designs will continue that tradition with grand staircases leading up to another classic Charleston-style element: a broad porch, or piazza, across the face of the entrance floor. Pairs of French doors and windows will open the interiors to the porches. Expressing traditional Southern details with more modern, pragmatic materials, Shaw says he will combine brick foundations and columns with fiber cement HardieBoard® shake shingles and horizontal HardieBoard® paneling on the exterior. Front porches will feature standing-seam metal roofs. The first of the three houses, now under construction, features the main living spaces, kitchen, and master bedroom suite on the entrance level with three more bedrooms and baths on the upper level. The corridors on the upper levels will overlook the lower level. A family room, guest bedroom and bath on ground level floor will be equipped to become an “in-law suite,” says Shaw, with options for a kitchenette, dining room, gas fireplace in the living room, and laundry room. October 26, 2016 (Chapel Hill, NC) — Shaw Design Associates of Chapel Hill and T.L. Stewart Builders of Sanford have announced that they have begun construction on their new Nottingham Road Project in West Raleigh — a trio of for-sale Charleston-style single-family homes. Site Work: Stewart razed two nondescript duplexes on the property so that he and Shaw could reconfigure the property into three lots, rather than four, with an alleyway connecting the three. Charleston Style: There are many variations of Charleston-style architecture, but one distinctive Low Country design element is the raised main level and entrance. Main levels were raised off the ground in Charleston to avoid floodwaters and to allow breezes to circulate under the house. Shaw’s designs will continue that tradition with grand staircases leading up to another classic Charleston-style element: a broad porch, or piazza, across the face of the entrance floor. Pairs of French doors and windows will open the interiors to the porches. For more information on the Nottingham Road Project, contact Terry Stewart: tstewart@tlstewartbuilders.com. For more information on Shaw Design Group, visit http://shawdesign.us. 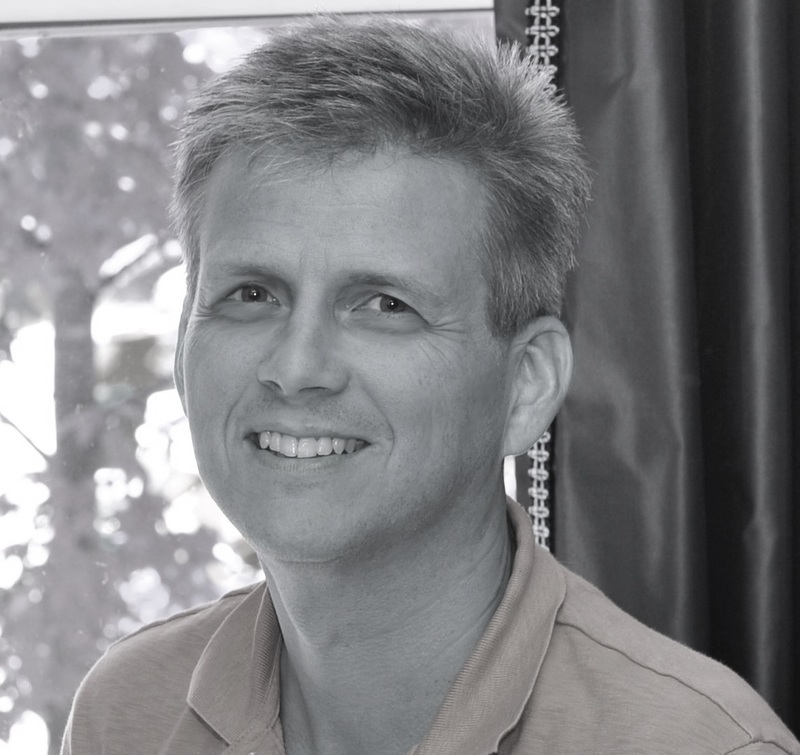 About Shaw Design Associates: Founded by Keith Shaw, AIA, in 1995, Shaw Design Associates, P.A. is a recognized leader in providing innovative architectural solutions for all project types – solutions based on time-tested, enduring standards and plan elements that are vital to design integrity. The firm adheres to these design truths by focusing on the land, the light, and the patterns of interaction between the owner, the structure, and the environment. Shaw Design Associates is located at 180 Providence Road, #8, Chapel Hill, NC 27514. For more information, visit shawdesign.us or call 919.493.0528. About T.L. Stewart Builders, Inc.: Custom homebuilder Terry Stewart established his business in 1984 to build “Homes to Believe In.” The company’s goal is to make it as easy as possible for their customers to build their dream homes. Years of experience help him guide clients towards the home they truly want. Accommodating and paying attention to all the details is foremost. T. L. Stewart Builders, Inc. is located at 613 Carthage Street in Sanford, NC. For more information call 919-774-8714or visit www.tlstewartbuilders.com. Chapel Hill-based architectural firm Shaw Design Associates is now preparing schematics for Phase Two of the building project at Chapel in the Pines Presbyterian Church, which will add a new 3191-square-foot Fellowship Hall and set the stage for a new entry courtyard to the church campus on Great Ridge Parkway just south of Chapel Hill. Main, sanctuary building completed in 2011. 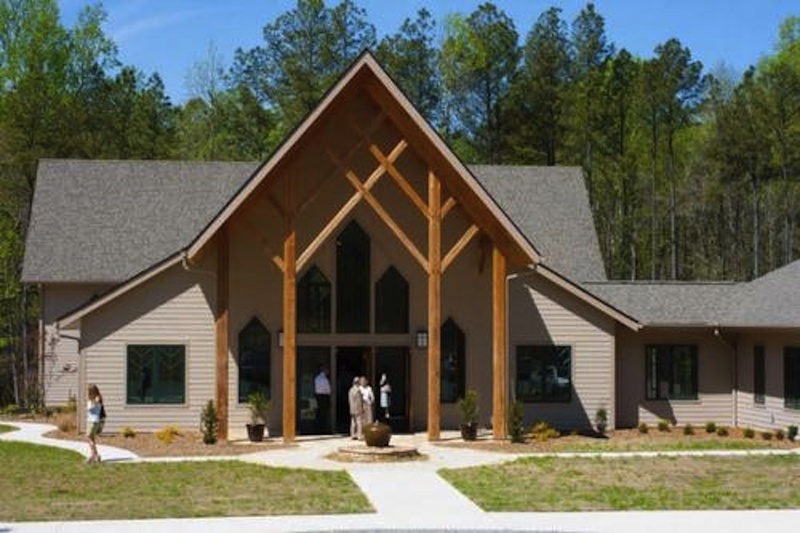 To incorporate that statement into the architecture for the 5201-square-foot sanctuary and 3191-square-foot Education Wing to its right that he completed in 2011, Shaw specified pine timber framing — cut from trees that are grown in managed timber land in North Carolina and prepared in Virginia – in deference to the pine forest surrounding the chapel. He also plans to use pine timber for the Fellowship Hall. “The simple forms and textures of the pine timbers reflect the natural surroundings and create a warm and inviting place to worship,” he said. As with the first two structures, views to the forest are a key element of the design. Tall windows will allow natural light to fill the interior, reducing the use of electric light. As it is in the sanctuary, indirect lighting will be used to reduce glare and illuminate natural timber beams above. To make the church as welcoming to its community as the committee’s statement suggests, Shaw designed each structure to human scale, rather than the grand, formal scale of many liturgical structures. However, the open timber roof construction accentuates the vertical lines characteristic of houses of worship, helping to lead the eye and spirit upward. The wood trusses, along with window detailing, recall the outstretched tree branches of the surrounding forest. The tall pine posts and beams supporting the gabled roof at the entrance portico suggest tree limbs reaching towards the sky. Shaw expects Phase Two to begin construction in the summer of 2016. For more information on Chapel in the Pines, visit http://citppc.org. For more information Shaw Design Associates, visit http://shawdesign.us.